UNITED NATIONS, July 29, updated -- The UN, which preaches about disseminating information and even hires pro-UN bloggers, has resisted including the word “bloggers” in its Media Accreditation Guidelines, which it put online on July 30. Click here. This despite the fact that the head of the UN's Department of Public Information, Kiyotaka Akasaka, who oversees the Accreditation and Liaison Unit (MALU), has a pro-UN (and ostensibly pro press freedom) blog on the Huffington Post. The previous and prospective chief of MALU told Inner City Press, “the UN does not accredit bloggers," and reiterated this after a New York Times piece identifying Inner City Press as the first blog at the UN. Yet even now, the UN refuses to put even the word “blogger” in its accreditation guidelines. The distinction seems to be between pro-UN blogs or those owned and controlled by large corporations and those with critical independence. This year, the UN Correspondents Association executive board, to which this reporter was elected, twice after debate and votes submitted language to MALU that they should explicitly include “bloggers” the Accreditation Guidelines, for which the UN wanted UNCA's concurrence. But following the first submission of UNCA suggestions, the UN accepted every proposal except on bloggers. After a second UNCA submission -- this time addressing concerns by referring to “journalists who are bloggers” -- the UN still demurred. Mr. Akasaka's outgoing deputy Eric Falt responded with what he called the “final” version, to be put online the next day, which only in a footnote mentions that online media includes blogs and vlogs. The reference is marginalized in a footnote, and there is no reference to bloggers as such. Why not? At a DPI event about Social Media held earlier this year in the UN's North Lawn building, chaired by Mr. Akasaka, UN staffers praised their own blogging and Tweeting of UN positions. Staff said they were paid to monitor Wikipedia to remove “inaccurate” information about UN officials. There is a larger context here. The UN has used the opportunity of its Capital Master Plan rehabilitiation to move the press corps from offices with walls, from which calls could be made and whistleblowers could visit, to a series of cubicles directly under the Department of Management. As exclusively exposed by Inner City Press, in what the UN dismissively called a "blog post," the cubicles initially came with security cameras above them, making it the whistleblower free zone. Still everything can be heard, and there are no improvements on the horizon. On July 27, the USG of DPI told me the bloggers would be in the guidelines. Given that the previous and perhaps future supervisor of MALU has said “the UN does not accredit bloggers,” if that is not the position, why is the word “blogger” not included in the Guidelines? Please -- an answer. But will that “understanding” be in the guidelines? Unanswered is the question of whether UNCA's consent should have required a vote of the full membership, and the larger question: why is the UN so scared of independent bloggers? 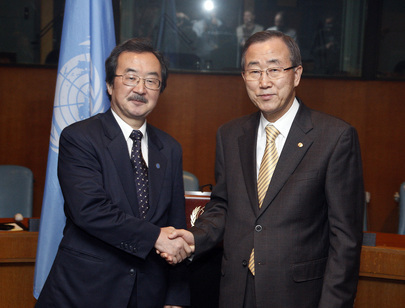 Due to outmoded UN distinctions between print and photo journalists, which make little sense for new media, Inner City Press has several times been blocked from filming or photographing events at the UN, and was most recently ordered to leave a photo op with the foreign minister of Rwanda while the UN's own in-house media, UN Photo, was allowed to stay. Click here from that story. The UN demanded the deletion from an Inner City Press "blog post" of a photograph of asbestos falling in areas frequented by staff, even women with babies in strollers, click here for that. The outgoing overseer of MALU, Eric Falt, is known to run morning meetings at 9:30 a.m. in the UN's “luggage building” at which messaging, and countering this publication by name, have according to sources at times been discussed. [Another participant has countered that the meetings are only to plan the UN's own p.r. work, not to discuss others' coverage. But] It seems to some that this UN is comfortable with UN controlled bloggers, but not independent journalists. UN Blocks Press From Rwanda Minister Photo Op, of DSG and UN Women, Bloggers Blocked Too? UNITED NATIONS, July 19 -- The UN on Monday barred any media except its own UN Photo unit from the beginning of a meeting between Deputy Secretary General Asha Rose Migiro and Louise Mushikiwabo, the Foreign Minister of Rwanda who is a finalist to head the UN Women agency. Inner City Press has exclusively reported the candidacy of Ms. Mushikiwabo to take the UN Women top post, about which Inner City Press asked DSG Migiro on July 16. When DSG Migiro's official schedule for July 19 included a 5:30 meeting with Ms. Mushikiwabo, Inner City Press went to cover it with UN Photo. There was without question a photo op: UN Photo had been asked to come to memorialize the meeting. But Inner City Press was told to place a separate call to UN Media Accreditation and Liaison Unit, to gain access. MALU called and was told that the meeting was open -- it had to be, since UN Photo would be there. MALU sent a staff member to the North Lawn building, who summoned a UN Security officer to screen Inner City Press. There was a pause -- Inner City Press followed the rules and did not even try to ask about UN Women -- and then the MALU staffer was summoned into the hall. What could the problem be? When the MALU staffer returned, he told Inner City Press to leave. No explanation was given. “We don't mind if you stay and take pictures,” Minister Mushikiwabo said. “It's not up to them,” Inner City Press was told. It was the UN's call, to restrict even this photo op to the UN's own in-house media. There are totalitarian states that operate this way. Ironically, Rwanda and Mushikiwabo favor restrictions on the press. But the UN? One might surmise that the UN's paranoia in this case means that Ms. Mushikiwabo is actually quite close to the job. But it could just be paranoia. Watch this site. Footnote: in other UN versus the press news, while Inner City Press earlier reported that the UN Department of Public Information was near to finally including bloggers in its accreditation guidelines, for now that has been blocked by UN DPI. The UN Correspondents Association, after an internal discussion including Inner City Press, submitted a series of proposed changes to the accreditation guidelines to DPI, with the word “blogger” included. DPI accepted all of the changes EXCEPT bloggers. This version was nearly finalized on July 16, until objection was raised. Now it appears that UNCA will meet again, and DPI and its chief -- and “blogger” -- Kiyotaka Akasaka will be asked to explain their aversion to including bloggers. Watch this site.